For the present study, we used the complete collection of eighteen AIV strains isolated from years 2002 to 2006 from nine different regions of Mexico. These strains were isolated and guarded by an officially certified laboratory to issue reports for control and eradication of avian influenza in Mexico. All AIVs were obtained from vaccinated birds showing clinical signs of avian influenza. Viral RNA extraction from allantoic fluid was performed using conventional methods . Reverse transcriptase PCR (RT-PCR) was used for the amplification of the HA cleavage site sequence, a marker for the virulence potential of avian influenza viruses . Sequencing of the HA gene segments was performed using the 3730Xl automated sequencer (Applied Biosystems, CA. USA). The nucleotide sequences obtained in this study (available from the authors upon request) and sequences retrieved from the GenBank database under accession numbers [GenBank:AY497063 to AY497096] produced from Mexican AIVs  were analyzed by using the CLUSTALW package and then edited using the jalview program . Because the sequences retrieved from GenBank differed in extension, the flanking N-term and C-term regions were removed for the alignment. Edited sequences were re-aligned using the ClustalX 1.81 program  with the following parameters. Pair-wise: gap opening = 10.0, gap extension = 0.10; Alignment: gap opening = 10.0, gap extension = 0.2, and Gonnet series weight matrix. Phylogenetic trees were constructed with the Maximum Parsimony method  using the PAUP* 4.0 b10 program . Trees were rooted using [GenBank:AY497063] (vaccine strain) as ancestral nucleotide sequence. The statistical significance of branch order was estimated by the generation of 1000 replications of bootstrap re-sampling of the originally-aligned nucleotide sequences. Current Mexican avian influenza virus lineages. 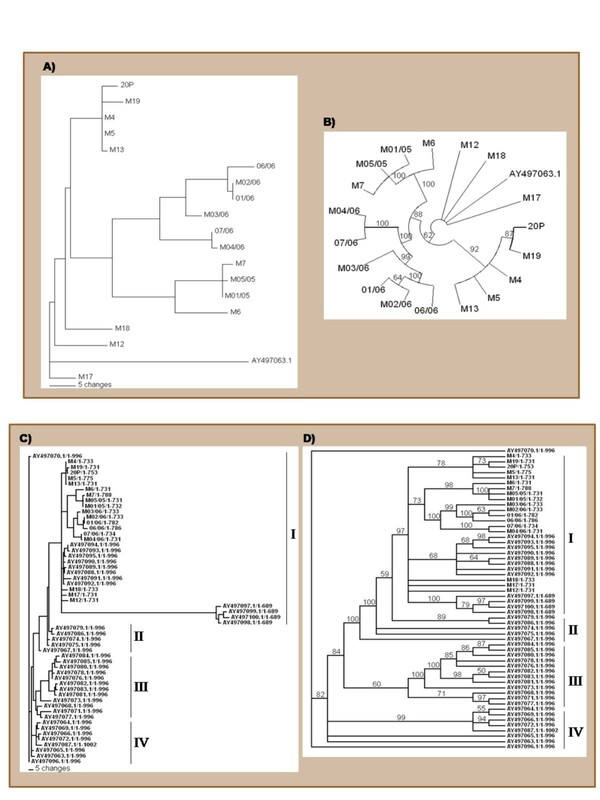 Phylogenetic rooted trees based on the nucleotide sequence of the hemagglutining (HA) gene (cleavage site sequence) from avian influenza virus (AIV) strains. Trees were constructed using maximum parsimony and best heuristic tree search analysis. The analysis shows the relationships of nucleotide sequences of the HA gene. The [GenBank:AY497063.1] nucleotide sequence was used for rooting. A) Phylogram tree and B) Circular tree showing bootstrap values (numbers on braches) after 1,000 replicates. Parts A and B include recent AIV isolates from years 2002 to 2006. Sequence labels are contractions of the official identifications: sequence label (official code) M4 (A/Chicken/Querétaro/M4/02), M5 (A/Chicken/Hidalgo/M5/02), M12 (A/Chicken/Nuevo León/M12/02), M13 (A/Chicken/San Luis Potosí/M13/02), M17 (A/Chicken/Puebla/M17//02), M18 9 (A/Chicken/San Luis Potosí/M18//02), M19 (no official ID), 20P (no official ID), M6 (A/Chicken/Colima/M6/05), M7 (A/Chicken/Jalisco/M7/05), M01/05 (A/Chicken/Aguascalientes/01-05/05), M05/05 (A/Chicken/Puebla/05-05/05), 01/06-A/Chicken/Puebla/01-06/06, M02/06 (A/Chicken/Estado de México/02-06/06), M03/06 (A/Chicken/Estado de México/03-06/06), M04/06 (A/Chicken/Puebla/04-06/06), 06/06 (A/Chicken/Puebla/06-06/06), 07/06 (A/Chicken/Puebla/07-06/06). For each official code: serotype/host/location/reference/year of isolation.C) Phylogram tree and D) Rectangular tree showing bootstrap values (numbers on braches) after 1000 replicates. Parts C and D include AIV isolated from 1994 to 2006. Current Mexican AIV lineages are indicated by I to IV. Sequence labels correspond to GenBank accession numbers/nucleotide fragment size (HA gene cleavage site) used for phylogenetic analysis. It is possible that avian influenza vaccination has resulted in accelerated genetic drifts in the HA gene sequence, as previously suggested by Lee et al. (2004). However, Ellis and Zambon (2001), Gambaryan et al. (2006), Widjaja et al. (2006) showed that viral replication per se allows for the expression of drifts among subsequent viral populations [14–16]. We thank Laura Guest and Karol Carrillo for technical assistance.